AnjaniAgarwal for the last 20 years has led the DRS transportation and logistics business in various capacities. He has given a new new dimension to logisitics Industry. He was instrumental in creating DRS Agarwal packers and movers, DRS Diliproadlines and the DRS International School. 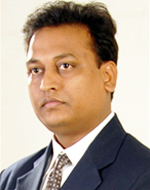 He has promoted DRS warehousing corporation, DRS labs, MDN Edify Pvt Ltd, he is motivitor behind several ventures of the group.